This guidance is for manufacturers and sponsors of listed and complementary medicines manufactured according to the PIC/S Guide to Good Manufacturing Practice for Medicinal Products (PIC/S Guide to GMP). This guidance does not apply to a medicine listed for export-only when the medicine would not be a listed or complementary medicine if supplied in Australia. This guidance is intended to clarify the interpretation of the PIC/S Guide to Good Manufacturing Practice for Medicinal Products (PIC/S Guide to GMP) in relation to the ongoing stability testing requirements for listed and complementary medicines. This guidance addresses compliance with the 'On-going stability programme' section of Chapter 6 - Quality Control in Part 1 of the PIC/S Guide to GMP. Evidence for the stability of medicines is an important part of quality control and is used to justify shelf life and storage conditions. The TGA has adopted a number of EU guidelines on stability testing. Stability testing for listed and complementary medicines is mandatory. All responsibilities related to ongoing stability testing should be defined in a GMP agreement (unless the sponsor, manufacturer and authorised person conducting release for supply are all from the same entity). The stability testing program can be contracted out to third parties. This can include physical storage under the specified controlled conditions and undertaking the testing at the specified time points. This text representation of this flowchart is provided as a list with numbered steps. Analytical methods are researched, developed and validated for a product or group of products. Include in the protocol relevant physical, chemical, biological and microbiological testing to support the marketed shelf life of the product. Production batches are manufactured and packed into selling units. The predetermined protocol is designed specifically for the finished product and the target market country using validated analytical methods. Place at least one batch of product for each group each year on the ongoing stability program under the predetermined study protocol. Conduct a risk assessment when a product is changed. Consider including in the ongoing stability program any production batches that have undergone a significant change or deviation to the process or package, rework, reprocessing or recovery operation. At each time point, report and review the results of the stability study. Ongoing stability study reports should be made available to the authorised person responsible for release for supply. The methods used for the stability testing of products need to be stability-indicating. Please note that not all compendial methods are stability-indicating. As a minimum, validate methods for specificity and robustness in accordance with the TGA's Finished product (medicine) analytical procedure validation for complementary medicines. It is unnecessary to monitor the level of impurities for listed and complementary medicines. The initial stability study shall be conducted in accordance with a predetermined protocol, which should be in line with the ICH Guideline time points for stability testing. Ongoing stability studies may use different time points as the data is used to confirm that the product remains stable over its shelf life if the initial studies have already been confirmed as acceptable. Include in the protocol relevant physical, chemical and microbiological testing to support the marketed shelf life of the product. The protocol for an ongoing stability program should extend to at least the end of the shelf life period. Conduct the ongoing stability program in line with the regulatory guidelines for the countries of destination. The testing requirements and storage conditions in the study design must meet the regulatory requirements of the countries the product will be sold into. The different regulatory requirements of different countries need to be considered when a sponsor first commences the stability program. Conduct stability testing in real time at the storage conditions specified on the product label. Other incubation conditions may need to be considered for export countries depending on their regulatory requirements. Ongoing stability testing is of the finished packed product. Consider whether bulk product or intermediate product should also be part of the ongoing stability program, particularly where bulk product is stored prior to being packaged or transported from a manufacturing site to a packaging site. To determine whether further studies are necessary, use a risk assessment process to evaluate the impact of storage of bulk and intermediate products on the stability of the packaged product. Include physical testing parameters specific to the medicinal product, including pack integrity. Consider microbiological testing throughout the study to support compliance with the expiry specifications. At a minimum, conduct microbiological testing at the initial and the end time points of the study. Test the active ingredients that are claimed on the label quantitatively throughout the study using validated stability-indicating methods. 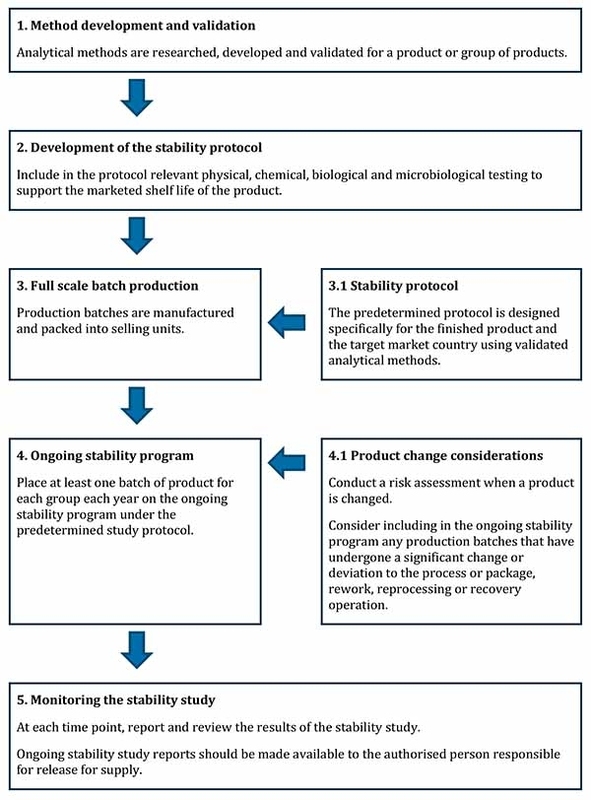 Reduced ongoing stability testing may be acceptable, with a documented risk assessment and justification, if full stability data for the support of the product listing shelf life is available for all active ingredients as per the label claim. For mineral active ingredients in an organic form, when possible, choose test methods specific for the organic form of the mineral. If this is not done, or an alternative test method is used, provide a justification. As a minimum, test minerals in an organic form at the initial time point and at the end of the ongoing stability study. For mineral actives ingredients that are not in an organic form, the content of inorganic salts is expected not to vary over the shelf life of the product, after quality control release testing has been completed. Products which contain herbal ingredients where no standardised component is claimed, should be considered for chromatographic profiling, based on the ingredients added to the individual batches. For complex products containing multiple herbal ingredients, it may be useful as part of the stability development stage to monitor chromatographic changes in individual herbal ingredient profiles. In full scale batch production, batches are manufactured and packed into finished product packaging. The predetermined protocol is designed specifically for the finished product and the target market country using stability-indicating validated analytical methods. At least one batch of product from each group each year should be placed on the ongoing stability program under the predetermined study protocol. A grouping approach can be undertaken with stability studies of listed and complementary medicines, because of the lower risk generally associated with these medicines. Document the scientific justification of the rationale used to establish product groupings. Base your justifications on the products having similarly constructed formulations, the same dosage form, method of manufacture and primary packaging materials. Document the justification for a particular product being representative of the group. A product with a complex formulation containing multiple active ingredients with a generic base could be selected as the worst case to represent a group of products that contain one of the active ingredients with the same or similar base formulation. The ongoing stability program for the group commences when a representative product is placed on the stability program. You can also rotate products within the group, provided that a documented justification is signed off prior to the batch being placed on the stability program. Conduct a risk assessment when a product is changed, to determine whether a new stability study is required to confirm that the change has not impacted the product adversely. Consider including in the ongoing stability program any production batches that have undergone a significant change or deviation to the process or package, rework, reprocessing or recovery operation. At each time point, report and review the results of the stability study. Review the data to identify out-of-trend (OOT) and out-of-specification (OOS) results. Compare all data from the previous time point with the latest reports to identify any significant changes in the product. Maintain a written summary of all the data generated, including any interim conclusions on the program. Review this summary periodically. Where analytical data is found to be OOS or where an atypical trend is observed, conduct a formal investigation. Where the shelf life of the product could be compromised, perform a risk assessment. Label subsequent production batches with a reduced shelf life to reflect the actual shelf life achievable. Ongoing stability reports should be summarised and authorised by a suitably experienced and qualified individual with a quality and/or technical and/or regulatory background for inclusion in the Product Quality Review. For further information, see contact details for enquiries about manufacturing therapeutic goods.